Water pollution: Too much nutrient and nitrogen from food waste in the water stresses the environment and other fish. Disease: Parasites, viruses, and bacteria can jump between wild and farmed fish. Farm fish that escape can interbreed with wild stocks creating unnatural competition. Chemicals: Banned or not, chemicals, drugs, and antibiotics frequently enter marine settings near aquaculture farms. And now, according to research published in the journal Environmental Science and Technology, there is another problem with some types of fish farming that could inadvertently hasten the spread of antibiotic-resistant bacteria. Ever Wonder What Is in Fish Food? Does it have antibiotics? Many fish farms outside the US routinely use antibiotics. The US government regulates the use of antibiotics within US waters, but farmers are allowed to use them when needed. The prophylactic use of antibiotics with fish or humans leads to problems of resistant bacteria. Toxic food chain: Salmon and bigger fish are higher up the food chain than smaller fish and have time to accumulate pollutants in their tissues. 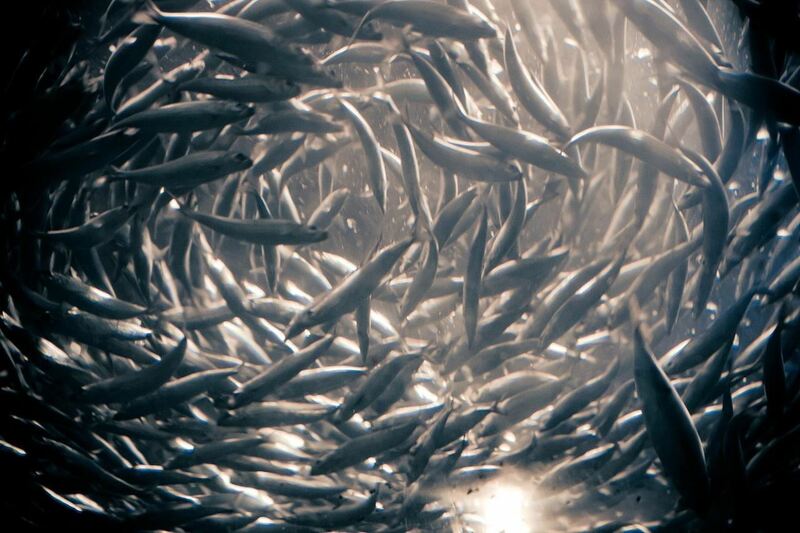 At the top of the food chain, when we eat the fish — we eat the pollutants too. Chemicals: Fish farms use fungicides and other chemicals to tamp down diseases. Authorities don't test imported salmon for fungicides like malachite green that is considered carcinogenic in animals. While that is a short list of the reasons you might be concerned about the environment of fish farms — have you considered what the fish are eating? About 20 million tons of fish per year are raised or harvested for use as fishmeal, not human consumption. 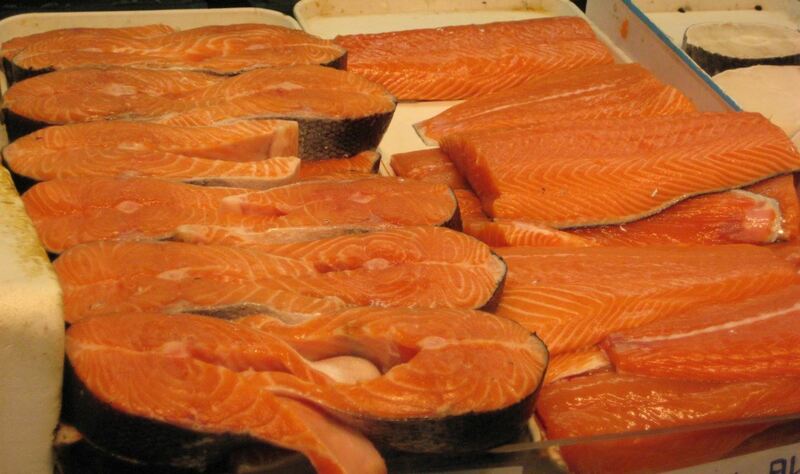 Fishmeal and fish oil are the main foods fed to restaurant-quality farmed fish, like salmon. Fish farmed for eventual use as fish food are often bathed and fed in antibiotics that leave residue in fish food even after processing. Farmers turn fish that are not considered palatable for "direct human consumption" into fish meal. Even after being steamed, dried, rendered and packaged, some of the compounds found in the original environment of the feeder fish remains. That could mean antibiotics, antibiotic-resistant genes, and sometimes heavy metals. Fish meal is used mainly to feed farmed fish but is sometimes also fed to poultry and pigs to increase dietary protein. For this study, the researchers sourced fish meal products from China, Peru, Russia, Chile, and the US. Once the fish meal was processed and sampled, the research team set up laboratory marine sediment beds (using sea water) to test the effect of uneaten fish meal residue as it settles to the ocean floor. Study authors estimate farmed animals absorb only about 35% of the fish food, and "the excess is released into the environment." By using mass spectrometry, chemical analysis, DNA extraction and sequencing, and statistical and network analysis, the team analyzed the concentration of antibiotics and antibiotic-resistant genes present in the food, to get a better sense of how much the fish meal brings to the farmed fish and their environment, the sea floor. The study authors write that fish meal is a "reservoir of ARGs (antibiotic-resistant genes) and exerts a previously underestimated impact on the antibiotic resistome in mariculture sediment." The "resistome" is the collection of antibiotic-resistant genes circulating among bacteria in the environment, and which could quicken the development of resistant bacteria. The "mariculture," is the sediment, or ocean floor, in a marine environment. Scientists screened for 23 antibiotics and located only 14 in the samples tested. But between six and 11 antibiotics were found in each sample. As to sources, some research results were variable. While samples of fish meal from Russia had the highest levels of antibiotics, they also had the lowest number of ARGs. Antibiotic resistant genes, when transferred between bacteria, can result in multi-drug resistant bacteria, or "superbugs." ARGs in fish meal products were traced to the raw materials used to make the fish food. Fish cultivated to become fish food are often given antibiotics as a preventative measure. Even when treated at a high temperature, the ARGs in the fish meal survive, even as the microbes die. Bacteria in fish meal failed to survive in the sediment and did not have a significant impact on bacterial colonies in the seabeds. Overall, the study authors found that fish meal increased the diversity and numbers of antibiotic-resistant genes in the sediment. The decomposing fish meal itself increased the carbon, nitrogen, and oxygen in the sediment, altering the cycles of existing bacteria. Higher numbers of antibiotic-resistant genes make the problem of "human pathogenic bacteria" circulating in ocean water and sediment more dangerous. The study identified 23 possible pathogens in the samples, including those that cause cholera, staph infections, tuberculosis, and anthrax, among others. The fish meal significantly boosted Vibrio (the bacteria that causes cholera) numbers, which already naturally occur in marine sediment. While the danger of excessive use of antibiotics in humans, pets, and agriculture is already understood, this newly identified area of antibiotic overuse adds to the story of how too much of a good thing is turning out to be a bad thing. Farmed fish is not going away. Fish are a healthier, resource-friendlier food source than beef for feeding growing global populations. Agencies like NOAA Fisheries are working to create sustainable aquaculture practices, while others are moving away from fish meal and toward other sources for fish food like soy or fly meal. Still, others are moving fish farming indoors to improve efficiency and reduce ocean contamination. Over time, these small steps could make a big difference and reduce the environmental and health impact of fish farming. Wait and see. In the mean time, ask your fishmonger if the farmed fish you're buying is antibiotic free.